When someone asks me to please bring a salad – which happens a lot, actually – this is the salad I bring. Because everybody, at some point during the meal, will say, "Oh my god, this salad is so good! Why is this salad so good?" And it's kind of hard to explain why, given that it's such a snap to make. But the combination of the very slightly sharp onions and the very slightly spicy, vinegary peppers along with the salty, creamy cheese makes this pretty much magical. You could add Chickpea Croutons, or black olives or sliced celery (I've done all of these things), but this is pretty perfect just the way it is, as long as you don’t try doing something crazy like skipping the pepperoncini. (And please note that these are pickled mild peppers, NOT the meat that goes on pizza.) Also? 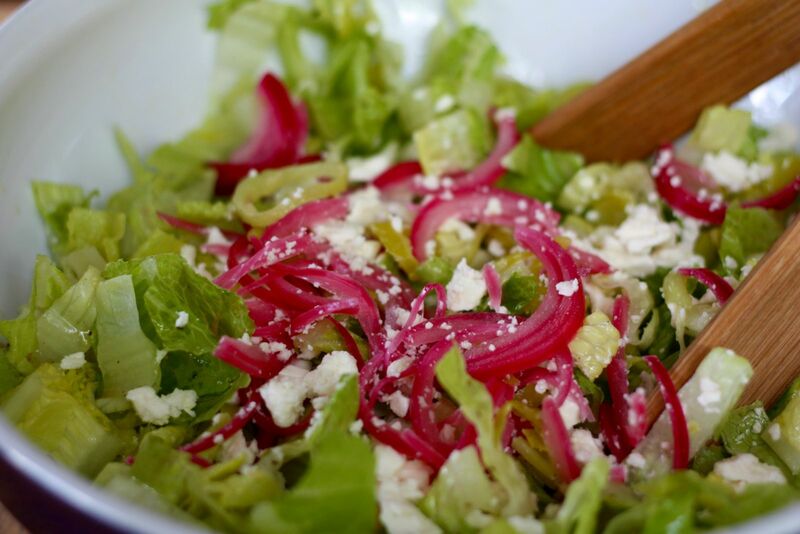 You should make the dressing and the pickled onions, because they will add around 3 minute to your prep time and be totally worth it. Put the lettuce in a salad bowl, and toss with 1/3 cup dressing. Add the rest of the ingredients and toss again. Taste a piece of lettuce. If it needs more dressing, add it and toss again. Whisk, blend, or shake up in a lidded jar 1 clove garlic, minced or pressed (or ¼ teaspoon garlic powder), 3 tablespoons white wine vinegar, 1/3 cup olive oil, 1 teaspoon kosher salt (or ½ teaspoon table salt), ½ teaspoon dried oregano, 1 tablespoon mayonnaise. Refrigerate up to a month. Bring to a boil ½ cup white vinegar and 1 teaspoon kosher salt – do this either in a small pot on the stove, or in the microwave, right in the mason jar you’re going to put the onions in. Add 1/2 a red onion, sliced, and refrigerate in the/a jar at least ½ hour and up to indefinitely.